If I could paint a picture of Australia with words, there’s about a 95-percent chance that “laid-back” will be in that description—and most of the time, this chill quality is why I’m so happy to now call Australia my home. 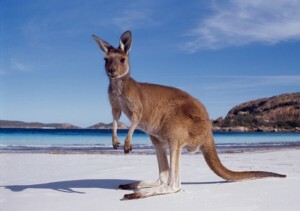 It’s also a great reason for anyone looking for a holiday destination to book a flight to Down Under. You just can’t argue with a place that has all the modern conveniences without all the modern-day stress you see in places like London or New York City. So how is Australia so relaxed and awesome? Glad you asked! Australians are extremely friendly, and this shows in the way people greet you and prefer to call you mate. And everyone’s a mate, from best buds to people at the shops. You have to admit, that’s about as casual as it comes. I have yet to hear an expat in Australia say that they think the work culture here is as grueling as back home. The truth is, the work culture is really laid-back, and this is apparent in the way Australians might have beers with lunch or the casual way they dress. Sure, there are some places that require suits and ties, but I’ve actually worked somewhere where employees “rocked up” with bare feet—daily. The standard leave time for Australians each year is four weeks. Can you imagine four weeks of holiday in the U.S.? It’s unimaginable—until, that is, you’ve put in years of time at the company. Even then, it’s hard ask bosses for more than two weeks off consecutively. Perhaps it’s because Australia is so far from everywhere else in the world that they tend to be more forgiving about big leaves all at once. Still, it’s a great part of the laid-back Aussie culture to enjoy, even with just a working holiday visa. This is a point that I absolutely adore. Instead of being bombarded on all sides by media promoting women with perfectly smooth skin and whiter-than-white teeth, the Aussie people we know and love are sporting more natural looks. Overall, there’s less makeup and plastic surgery on TV and in advertising and, as a female, I just love it because you feel like a normal person. I live in Sydney, and I can’t help but laugh when I hear Australians talk about how hectic Sydney life seems to them. Are you kidding me? Sure, it’s a bit busy at certain times of the day—a fact that is further enhanced by the less-than-perfect Sydney transportation network (particularly for those driving)—but compared to places like London or New York, this major city is a breeze. A trip to Australia can involve so many things—hanging at the beach to camping in the outback under clear night skies—so it’s always a great idea for anyone needing a new place to holiday. But the plethora of activities and scenery there are only made better by the laid-back culture of the people living there. Brooke Schoenman is the blogger behind WhyGo Australia, an online travel guide to the land Down Under. Find hostels in Sydney, check out campervans in Australia or learn more about what to see and do in Oz.